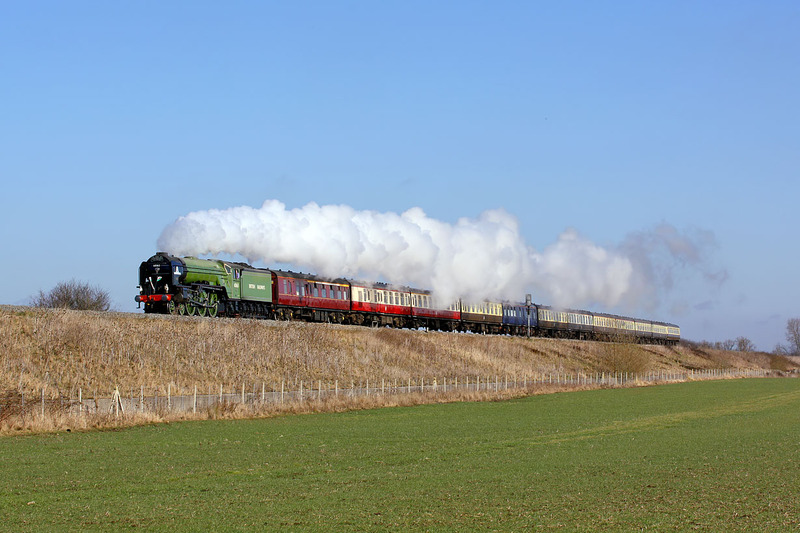 A1 4-6-2 60163 Tornado approaches the site of Knighton Crossing (between Didcot and Swindon) with the Steam Dreams 1Z88 08:45 Victoria to Swansea 'St. David's Day Cathedrals Express' railtour on 1 March 2010. I had deliberately chosen this location, as not only would the sun be on the front, but I thought the low viewpoint would ensure that the exhaust would not be blowing down across the train. As there was virtually no wind, I was slightly surprised that the exhaust very nearly did ruin the shot by covering up the coaches. However, looking at the mixed rake of stock with no less than four different liveries, perhaps that would have been no bad thing!